Tom Sherbourne took a job as a lighthouse keeper on the remote Janus Rock, using the solitude to recover from his years on the Western Front. During a visit to Port Partageuse on the mainland, he meets Isabel Graysmark and the two eventually marry. He takes her out to Janus, where their only interaction with the rest of the world is when the supply boat arrives a few times a year. They try to build a family in their home, but Isabel suffers two miscarriages and then a stillbirth. Just two weeks after the stillbirth, a small boat runs ashore with a dead man and a baby who is very much alive. 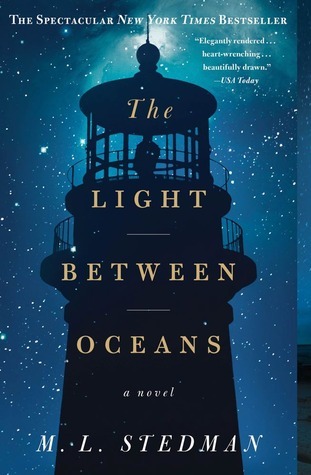 The Light Between Oceans: A Novel by M. L. Stedman is the story of how Tom and Isabel deal with this situation, and the consequences that their decision has on everyone. Tom is a rule-follower and wants to report the boat immediately. But Isabel, desperately longing for child, is convinced God has sent this child to them and they are meant to raise her as their own. She names her Lucy, and convinces Tom to pretend that she is their own. Stedman paints a wonderful picture of Janus Rock, the land, the light, and the sea that surrounds it. I enjoyed learning a bit about how lighthouses worked in the early 20th century, and what went into caring for one. To think that people lived there in completely solitude, only returning to the mainland every three years, is hard to imagine. I also found Stedman's portrayal of life in Australia after World War I poignant. Unfortunately, I didn't fully enjoy this novel because I felt that everyone was miserable throughout most of it. It was rather depressing to read. For a few years, Isabel and Lucy are happy, but everyone else is not. Then, later, everyone is pretty much miserable. This took a lot away from the book for me. I will say that many of the women in my book club enjoyed The Light Between Oceans more than me. It did present some interesting questions about the affects of miscarriage on women (and men) and how many of us could understand the actions that Tom and Isabel take. Be forewarned that the descriptions of the miscarriages and stillbirth may be disturbing to some readers. Overall, The Light Between Oceans is a good historical fiction novel that does make for a good book club discussion. It's just a bit too depressing for me. This review was written based on a copy of The Light Between Oceans that I purchased. Aw, I don't want to read about other people's misery. If there's nothing redeeming, I might have to pass on this one. Thanks for your honest review. There are many positive reviews, but I just found it to be too much for me. I do love to read, but may also have to pass on this one. Miscarriage and loss is a hard topic for me. Thank you for sharing and for being so forthcoming in your review. I know it is a very hard subject for many, so I wanted to be sure to mention it. To bad you didn't enjoy the book it sounds pretty miserable. I don't read much as it is so I will pass on this as well. It does have many redeeming aspects, but I just found it too depressing myself. Oh, boo. I always love the cover of this book. But I get it. I hate that depressive feel and sense from a read. And when everyone is miserable it gets me mad!! Yes, I felt so frustrated for most of the book. There were far too many bad choices made and it drove me nuts!